I’ve had such wonderful response with my TABRIZ piano bench seat cover, that I decided to create another one for the site! This exquisite design started as a small needlepoint area rug that I had already adapted from one of William Morris’ Hammersmith designs. 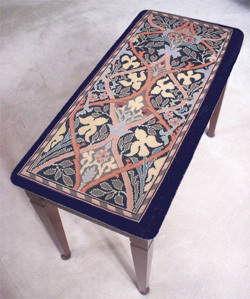 Its graceful proportions and colours are perfectly suited to creating an elegant needlepoint tapestry for a standard size piano bench. Click here to have a look if you missed it! 1.GO SHOPPING WITH ZIVA ! Since the last newsletter, I’ve finished adding the shopping pages for all the current ZIVA needlepoint designs! For more detail, you can go to our Terms and Conditionspage to learn more about the services we offer. In the last newsletter, I gave you a sampling of my new cell phone case and change purse designs. I’ve now added them to the site! Click here if you haven’t seen them! They’re ideal small projects for beginners: the designs aren’t overly complicated. I’ve chosen the 2-4-6-8 stitch for Your Stitch to Trythis time. I love the name of this stitch! It basically tells you how to do it just by its name! I love its Art Deco look! 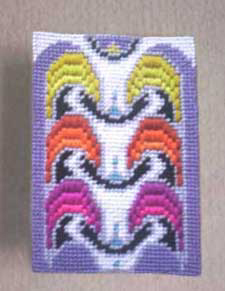 Work the diamonds in horizontal rows, leaving 2 threads of canvas between each group. On the second and subsequent rows, the diamonds fit in the gap left by the first row-the stitch over 2 threads sharing a home with the stitch over 6 threads of the previous row and so on. Get out a scrap of canvas and some left-over yarn, and use the above grid at right as your guide, starting at A . Use 2 colour yarns to alternate the rows to make it easy to see the pattern developing like the above photo at left. Now it’s time to try it as I designed it for the DECO Diamondspicture frame… this newsletter’s free design. 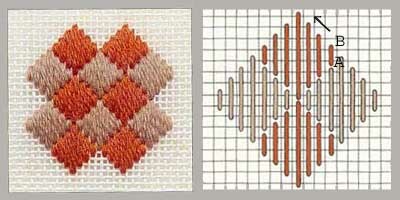 The photo at right is what you want this new stitch to look like when you’ve finished practicing it. Don’t worry what colours you use at this stage, but make sure you alternate the colours in each small diamond, so you can see the effect. Again take a piece of scrap canvas to practice with., and refer to the diagram at right. Practice the stitch with left-over wool yarn. 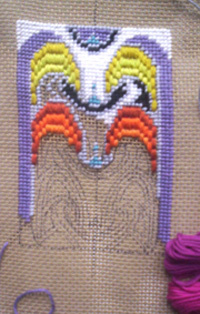 Start at A with your first colour (grey-blue in the diagram) and stitch over 2 ,6, 6 and 2 threads, leaving a gap of one row for the second colour. Keep turning the canvas 45° to create each small diamond, until you’re back where you started! Note that the next diamond shape you start below the one you just created shares the same hole at the “tip” of the diamond. Keep practicing until you feel confident that you’ve got it! Then you are ready to stitch the free design! I added a thin black line to the picture frame design to give it a more Deco look. It also goes well with the black metallic frame I wanted to use. This effect can be created with a stitch known as the Back stitch, which you do after you’ve finished stitching the picture frame. It’s strictly optional. 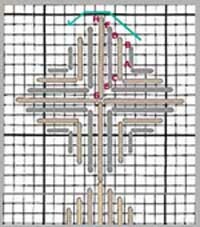 If you like it, practice it by following the diagram at right stitching over two threads to create a straight stitched line. Wear it on your belt or put it in your handbag… either way its sizzling hot colours will set off your summer whites, or complement today’s vibrant colours that everyone loves to wear when it’s hot! The size of the finished needlepoint cell phone case is approx. 3 ½” wide x 5” high (approx. 8.8 cm x 13 cm)… large enough for most cell phones. The cotton yarns for the Bargello stitch are in a range of gradated tones from acidic yellow and yellowy-greens, to vibrant oranges and hot fuchsias! The rest of the case is stitched in the Basketweave Tent stitch, in white, light grey, mauve and black cotton yarn. I have indicated the centre line, both horizontally and vertically, of the design on the charts for your reference. I’ve also indicated thin black outlines at the top of both charts just to show you where the white yarn colour is stitched to. You will need two skeins each for the white, grey and mauve colours and one skein each for the rest of the colours. Start by putting masking tape on the canvas edges to protect the yarns from getting frayed. Count 41 stitches across and 60 stitches down and outline the outside rectangle of the case with a waterproof pen. Start with stitching the mauve colour in the basketweave tent stitch down the right side of the canvas. Stitch the Bargello stitch in the gradated yellows in the top right, just as you had practiced it. Don’t forget to double the yarn so the canvas doesn’t show through. 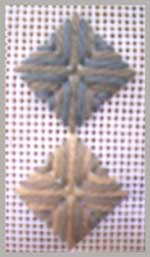 You’ll notice that the design is repeated: Stitch the top including the top yellow shapes and the white ‘link’ shape below it according to the chart. After that, you only need to repeat the design as you stitch down the canvas. 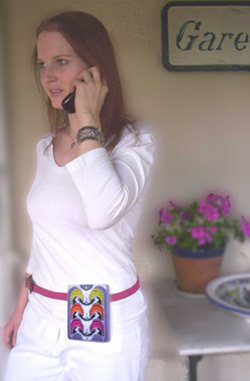 If you don’t want to wear it on your belt, you could stitch it a second time so the design is on both sides to make a mobile phone case for your handbag. The yarn quantities I’ve included in this newsletter will be enough to do this. 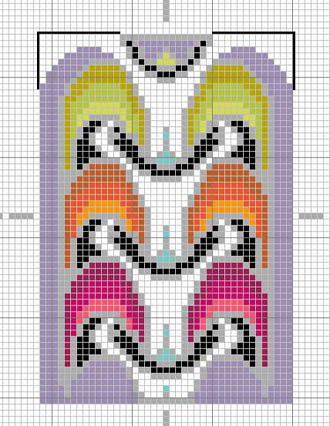 If you’re using 13 gauge canvas, you may not need to double the yarn for the Bargello stitch. Practice it first and judge for yourself. If you do double the cotton thread, make sure it doesn’t twist as you stitch it. Keeping the thread straight gives a wonderful smooth appearance, and shows off the lovely dull sheen of the rich cotton colours. The cell phone case was made up in light grey cotton fabric for the backing, with 1” bottom and side panels in the same fabric. But the finishing fabric colour could be bolder! Why not a fuchsia or purple? Any colour from the cell phone case palette will work. For thinner cell phones, you might consider a knife edge finish, instead of the 1” panels. The same light grey fabric was also used to sew a full width narrow channel on the back for slipping the belt through. Another idea: You could also make a wide loop of the same finishing fabric on the back, and attach it with Velcro over your belt to fit any belt width. You could make it up as described above… simply without the back channel. 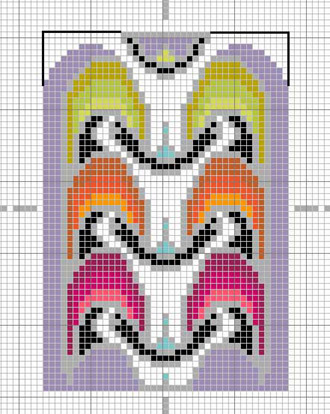 You could also stitch the design twice to have the design on both sides: even alternate the vibrant Bargello colours the second time! Why not! Add a border in one of the colours to create a larger case for your glasses if you prefer!! Do you include the yarns with your painted canvas? When I create my needlepoint designs, I have certain yarn colours in mind. I always include a list of these colours with their quantities with your hand painted canvas. This allows you to find the best price for yarn possible, whether it’s from suppliers on-line who ship world-wide or from your local needlepoint shop. As a designer, I’d rather remain independent and work with the right yarns for the right project for my client, and not be tied down to one manufacturer. Also, you may prefer a certain yarn manufacturer, so I’d rather develop the colours to suit your yarn preference. New designs in the works! New belt, piano bench and seat cover designs will be on the site in the next few months! The next VIVA ZIVA! Newsletter #0903 will be issued in October 2009 . Free needlepoint design of a picture frame . Perfect to make up as a gift for the holiday season!